Thai-German national David Pfizenmaier walks through a traffic intersection holding a sign encouraging Thais to vote in the upcoming election in Bangkok on March 21, 2019. 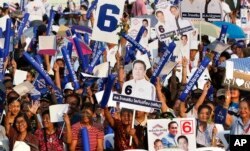 More than 40 political parties will take part in the Thai election on Sunday. As Thailand heads to the ballot box for the first time since the military took over in a coup five years ago, observers and analysts have said that Cambodia should pay close attention to its neighbors strategic and political development. But analysts who spoke to VOA Khmer this week said the outcome was unlikely to have a significant impact on Cambodia-Thailand relations as Cambodia had shown previously that it could adapt to changes in the Thai ruling elite. Ngoun Kimly, a senior lecturer of international studies at the Royal University of Phnom Penh, said the stable relations between the two countries since the military took over Thailand in 2014 was a marked improvement from the hostile relations the two countries had toward each other over the previous decade. "Recent political history has shown that political elites in both countries have manipulated nationalist sentiments related to territorial sovereignty and cultural heritage sites to advance their political agenda especially when they faced a severe legitimacy deficit," Kimly wrote in an email. "However, if the current trend of the relations is to continue, the ruling elites in both countries share common political and economic interests in maintaining a stable relationship," the Canberra-based analyst added. The Cambodian government faces the threat of possible trade sanctions from the European Union and the United States, which have already placed limited sanctions on Prime Minister Hun Sen’s government over its widespread crackdown on the opposition and civil society. The chief coup-maker, junta Prime Minister Prayuth Chan-o-Cha, said he intends to retain power and has overseen the drafting of a new constitution and new election law. He was appointed as the prime ministerial candidate for the Palang Pracharat Party. Meanwhile, the pro-Thaksin Shinawatra and new anti-junta political camps, such as a newly-established party, Future Forward, want to win to curb the power of the military in political life. The new law aims to diminish the support of the pro-Thaksin parties. It requires a joint election of 500 elected members of the lower house and another 250 members of the upper house who are appointed by the military government. “Due to the domestic politics of these two countries, some sensitive issues such as the territorial claim over the Preah Vihear temple zone and the overlapping maritime territories are unlikely to happen sometime soon," Kimly said. “Because of the nature of the current political contexts in both countries, both governments will likely set aside sensitive issues like overlapping territorial claims. They prioritize the regime’s stability over anything else,” he added. Prime Minister Hun Sen was a long-time supporter of Thaksin amid the armed confrontation over the Preah Vihear temple zone from 2008 to 2011. 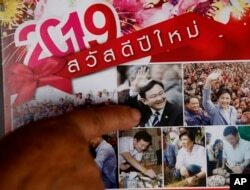 In this March 14, 2019, photo, Nuwate Jiamwong, the 59-year-old farmer, points at an image of former Prime Minister Thaksin Shinawatra on a calendar in Nakhon Ratchasima, Thailand. In 2009, Hun Sen made Thaksin one of his economic advisers, prompting anger from the Thai government. The bilateral ties between the two countries improved between 2011 and 2014 while Thailand was under the administration of Yingluck Shinawatra of the Pheu Thai Party, Thaksin’s sister. The military takeover in 2014 led to the expulsion of about 250,000 undocumented Cambodian migrant workers from Thailand. It is estimated that there are about 1 million Cambodian migrant workers in Thailand, mostly working in the construction, manufacturing, services and fishery industries. Thitinan Pongsudhirak, director of the Institute of Security and International Studies at Thailand's Chulalongkorn University, told VOA Khmer that expulsion of Cambodian workers sent a clear message to the Cambodia prime minister and his government that Cambodia should not interfere in domestic Thai politics. "For prime minister Hun Sen, I think he got a message and the signal from the Thai military government that he should not be interfering or meddling in Thai internal affairs. So I think that message has been received," Thitinan said in a phone interview. According to analysts, the relations between Hun Sen’s government and Prayuth’s have since stabilized. Thitinan said the new Thai government, regardless of whether they come from conservative military camp or pro-Thaksin camp, will seek to maintain strong relations with Cambodia. "I think if the other side, the pro-Thaksin camp or the anti-junta more correctly anti-military camps- comprising the Thaksin-aligned parties, but also other parties if they happen to somehow win, relations with Cambodia will also be more or less on the same trajectory," he said. "So I think either side winning, the relations should be on course, on course, stable. I don’t think that a new Thai government will take a different approach to Cambodia. They might have a different approach toward bigger powers like China, the United States, but I think for the immediate next-door neighbors, Cambodia, Myanmar, and Laos, things should be more or less continuous." Sek Sophal, a researcher at the Ritsumeikan Center for Asia and Pacific Studies in Japan, said Thailand-Cambodia stability over the past five years was seen as a necessity on Thailand's side to restore internal order and build their power base. Supporters of the Palang Pracharat Party cheer during an election campaign rally ahead of Sunday's general election in Bangkok, Thailand, Friday, March 22, 2019. "If we take a look at the geopolitical map, Cambodia is a small country next to Thailand, which is a big country. So the political development in Thailand will more or less have a direct or indirect impact on Cambodia," Sophal said during a recent interview on the Hello VOA talk show. "For the time being, if we take a look at the military groups when they come to power, the relations between the two countries tends to be very stable. But it is uncertain. Previously, due to their political agenda to maintain internal stability, the junta didn’t cause any conflict with their neighbors. But now if the junta government is legitimately elected to be the leader of the country, it is hard for us to predict [the outcome]," he added. However, relations between Phnom Penh and Bangkok were tested in early 2019 when the Hong-Kong-based South China Morning Post published an exclusive news report alleging Yingluck had used a Cambodian passport to flee arrest in 2017. Two days later, Hun Sen ordered officials to withdraw Cambodian passports from foreign consultants to the government. This act was seen by the Thai junta’s foreign minister, Don Pramudvinai, as a sign that Cambodia continued to value the close relationship with its neighbor. Jakrapob Penkair, a close aide to Thaksin living overseas, told VOA Khmer that the friendship between the former Thai prime minister and Hun Sen dated back to 2003 when the two leaders negotiated an easing of tensions after riots in Phnom Penh that led to the burning of the Thai embassy. For now, Thaksin and Hun Sen still maintain a “good private relationship” though it has been “shaky” from time to time, said Jakrapob, who served as the spokesman of Thaksin Shinawatra's administration in prior to the 2006 coup. “As far as I know, they still contact each other as friends," Jakrapob said. “But Prime Minister Thaksin knows that he is not in charge of Thailand, he would not put Prime Minister Hun Sen into difficulty.